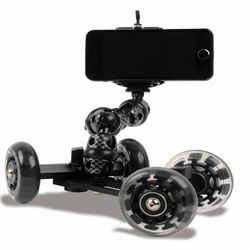 Take smooth tracking shots with your camera phone on any flat surface with the iStabilizer Dolly. Just clip your phone into the secure grip of the included iStabilizer mount and start shooting the smoothest zooming, tracking and panning shots imaginable. The flexible segmented mounting arm provides a huge range of shooting positions while the rollerblade wheels provide stable control. The wheel axles can even be turned 60 degrees for curved paths. The included iStabilizer mount fits cameras up to 2 3/4" (7cm) wide and can also be used on any tripod.